“There were many people who quoted Christianity at me, telling me it’s not right because Jesus didn’t want it… But traditional Inuit spirituality is extremely diverse.” ~ Nuka Fennell, a 24-year-old Iqaluit community member. 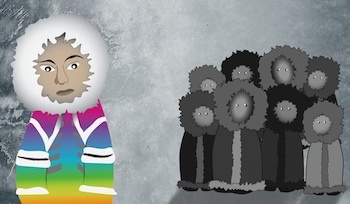 A new film based in Nunavut is teaching people about gender norms in the north. The film, called “Two Soft Things, Two Hard Things,” focuses in on a Pride Day event in Iqaluit, celebrating the LGBTQ2 community there—lesbian, gay, bi, trans, queer and two-spirited. Directors Mark Woods and Mike Yerxa heard about it and flew up to the area to catch the action, finding an opportunity to educate the audience—and themselves—in the process. “We as southerners knew very little about the history. We’re not really taught it in schools growing up, and I was certainly embarrassed about how little I knew… the colonization of the Northwest Territories and Christianization of that area have really impacted attitudes towards sexuality and gender,” said Yerxa, giving insight into the basic premise of the movie. “We got a crash course and met some very beautiful people willing to tell us their stories,” he said. The actual Pride event was last October, and the team flew to Iqaluit for three-and-a-half days to cover it. Prior to going, they made contact with a few members of the community who could open up the event to them, and put them in touch with some of the LGBTQ2 looking forward to it. “When we went up to film, it was very clear cut about the attitudes people have… They are very Christianized, and their cultures were taken from them… But I really didn’t know any of that until working on the film and doing the research,” said Yerxa. Nuka Fennell is a 24-year-old Iqaluit community member who speaks in the film about their (they prefer this gender neutral term in comparison to he or she) experience as a queer person. Fennell moved to Ottawa at the age of 16, just to escape the attitudes and ostracism from people at home. While Fennell’s family was always supportive, Fennell couldn’t say the same for the townspeople. Fennell spent time in shelters in Ottawa, and living on the street, just to avoid having to go back home. After struggling for a few years, Fennell returned to Iqaluit, but faced the same emotional, as well as physical violence, as before. Ottawa has been Fennell’s permanent home since then. “I felt like they were going to push me over the edge… at the time I was self-harming, and the suicide rate was really high for queer folks there,” said Fennell. That type of experience is explained in more detail in the film. It’s reinforced by the voices of others who’ve had similar experiences, or people with knowledge of the contributing factors to that type of experience, such as University of Toronto PhD candidate, Jerald Sabin and local politician, Jack Anawak. Each character in the film touches on the fact that Inuit were at one time more peaceful, and even opened to different types of sexuality, before a foreign religious system left its mark. “There were many people who quoted Christianity at me, telling me it’s not right because Jesus didn’t want it… But traditional Inuit spirituality is extremely diverse,” said Fennell. For director Woods, the most memorable part of the filming was in meeting the people willing to talk about the issue. Of course, it wasn’t easy right off the bat, as years of colonialism led to a distrust of foreigners—especially foreigners with an agenda, said Woods. But it wasn’t long before he and Yerxa were accepted, and even invited into the homes of people for dinner. “There were so many wonderful moments… shocking moments. I think as far as going up there… the most surprising was what the youth are up to. That includes education at the administration level, like having queer proms and being LGBTQ inclusive,” he said. “We were so impressed with them because they’re aware of these issues, whereas the generation before them wasn’t really discussing it,” said Woods. As for Wood’s hope for the film, he’s just happy to start the conversation. “The screening on Friday in Ottawa is for the Canadian Center for Gender and Sexual Diversity. They’re launching a Two-Spirit Campaign... The best part of having this film screen places like that is it’s starting a discussion. It gives people not only the chance to ask us questions, but to ask themselves questions,” he said.